Spirits innovator Emporia Brands and award-winning Chairman’s Reserve rum of St Lucia Distillers, are proud to announce the winning venue for the 2017 Chairman’s Reserve Mai Tai campaign. Milk Bar from Reading were announced on Tuesday 26th September winners at The Magic Roundabout, one of London iconic pop-up sites. The final saw five venues from across the UK recreate their Chairman’s Mai Tai’s to the public and VIP judges, hoping to win a trip for two to St Lucia as part of the prestige Chairman’s XI programme. Joining Milk at the final were last year’s winners Alvino’s of Newcastle upon Tyne, Colonel Porter’s, also of Newcastle upon Tyne, Ten Mill Lane from Cardiff and wild card entry of Panda & Sons from Edinburgh. 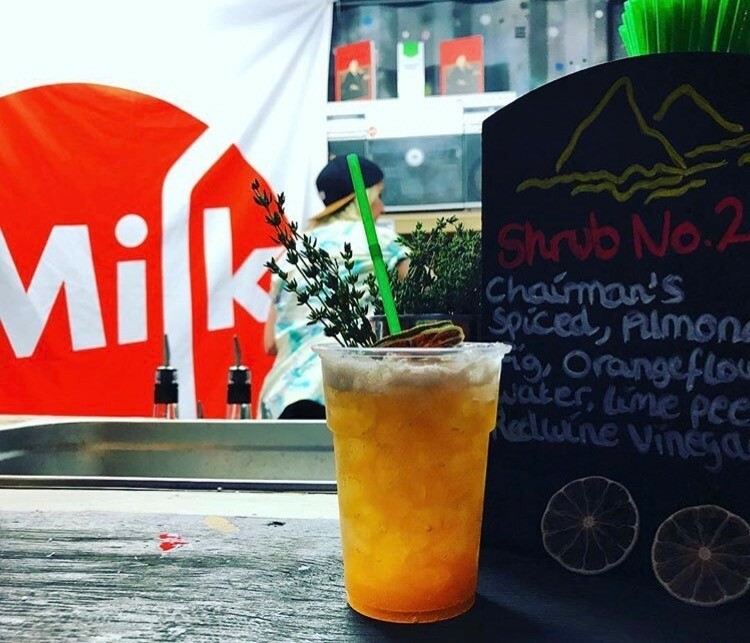 With a secret panel of judges on hand to test out each cocktail, Milk were deemed worthy winners for 2017 and earnt their place on the plane to St Lucia. Shake and strain over crushed ice in up-cycled food tin. Garnish with a thyme sprig, dehydrated lime and desiccated coconut. 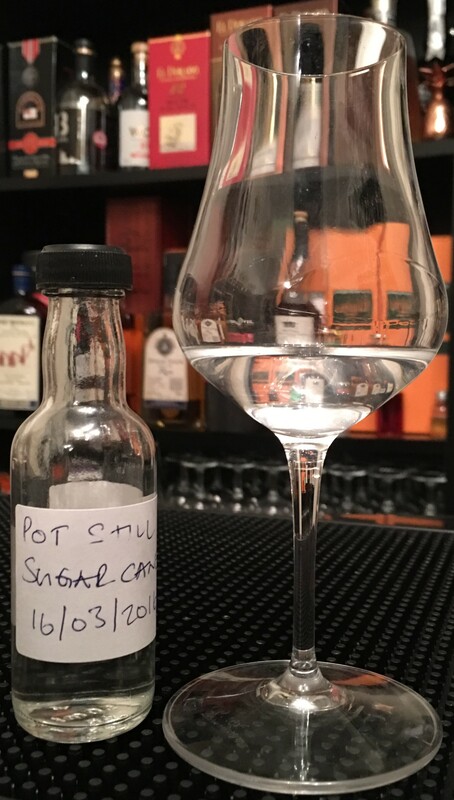 This will be kind of a unique post because it’s maybe a little self-indulgent, as you can’t actually purchase the Rums individually….they are a choice few individual aged and unaged distillates that I was lucky enough to try during the St Lucia Distillers On Tour event in April. I was fortunately able to sweet talk Dave Marsland enough for him to allow me to decant a few samples to try at my leisure…..well I have finally found that leisure time. 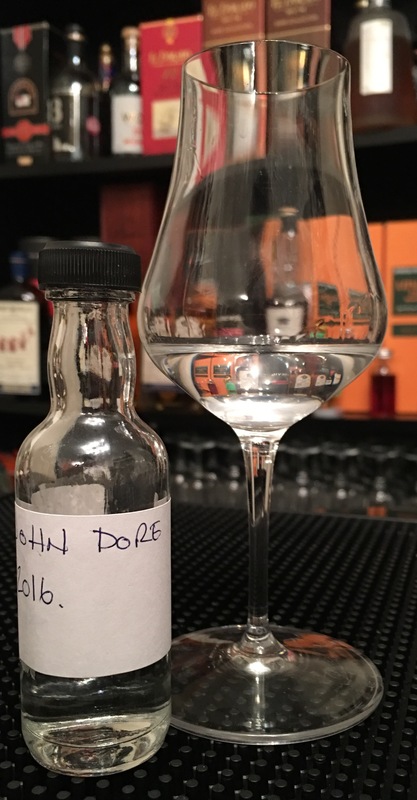 What I hope that this post of quick fire notes will do is give some sort of insight into my thoughts on some of the individual marques that are produced at St Lucia Distillers which could also link into how these are used in the excellent 1931 series of releases that have seen success of late. I have covered the various output at St Lucia Distillers in the article on 1931 linked above and in the following articles based upon the Chairman’s Reserve Range and Admiral Rodney. Up for tasting within this article are a 5 year aged Coffey Column Distillate, a 5 year aged John Dore (assumed I) Pot Distillate, a 5 year aged Vendome Pot Distillate, a 4 year aged Sugarcane Juice Pot Distillate (could be Vendome or John Dore I), an unaged John Dore (assumed I) Pot Distillate and an unaged Sugarcane Juice Pot Distillate (could be Vendome or John Dore I)….there were a couple more available but sadly not enough sample bottles on my part. Anyhow without further ado, we’ll head straight into it….. 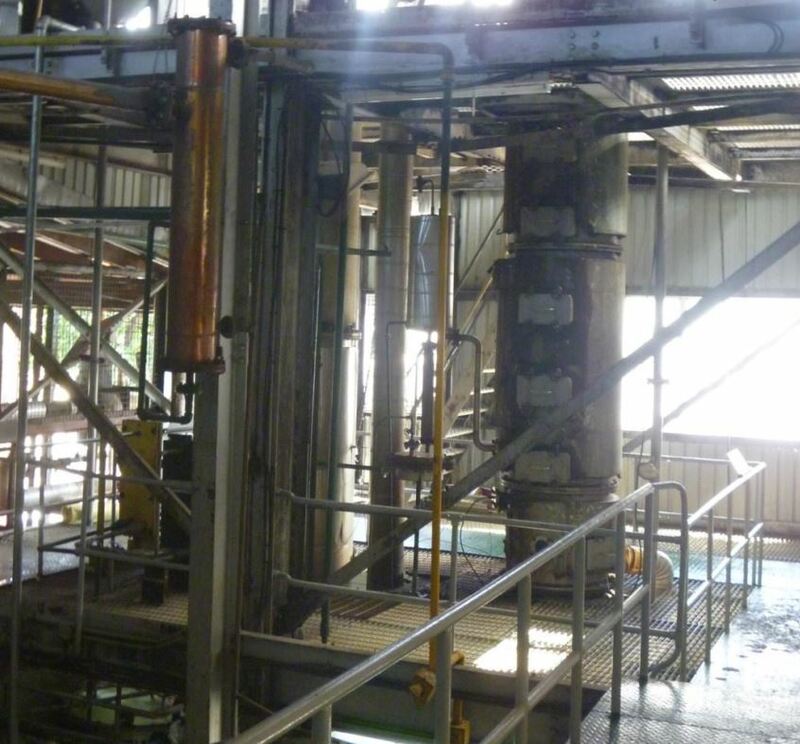 I have obtained a few images of the pot stills at St Lucia Distillers straight from Michael Speakman and they give a wonderful insight into the arrangement at the distillery…the column still shot is stolen from a SLD presentation document that was made available to me…. Glass: It is crystal clear in the glass and not too clingy. Beautifully pungent. Initial notes are of brine and a sprinkling of salt on a stick of celery. Its grassy and vegetal whilst having a deeper sweetness. Lightly fragrant, with an almost floral note. There is also the lightest whiff of public swimming baths over here in the UK…..a deep rooted smell from my childhood. Mouth: There is an initial very apparent sweetness along with a peppery celery. It is a little herbal and does for me, display the characteristics of some of the more established agricole brands on the market. In particular the J. Bally Blanc. It is all very light and drinkable with a slight savoury, herbal butter sign off on the finish. Needs more oomph….but that’s not the point if this distillate. Glass: Light toffee colour and what appears to be a slight cloudiness which could be temperature related. This is very light with no real up front punch. I have to wait a while before I get a little light oaken vanilla. This is backed up with a slightly sour cherry note. Faint pear drop like astringency pokes its nose through. On the surface it appears to have lost the majority of its agricole like character during maturation. Additional notes are of a mild, herbal grassiness. Mouth: Light sweetness leads with an immediate cut into drying oak. Black pepper and a fennel seed note hit the mid palate. It does show itself as a little more agricole like on the palate as the grassy, vegetal spine is there albeit somewhat subdued. It has a relatively short grassy finish with a hint of oak. 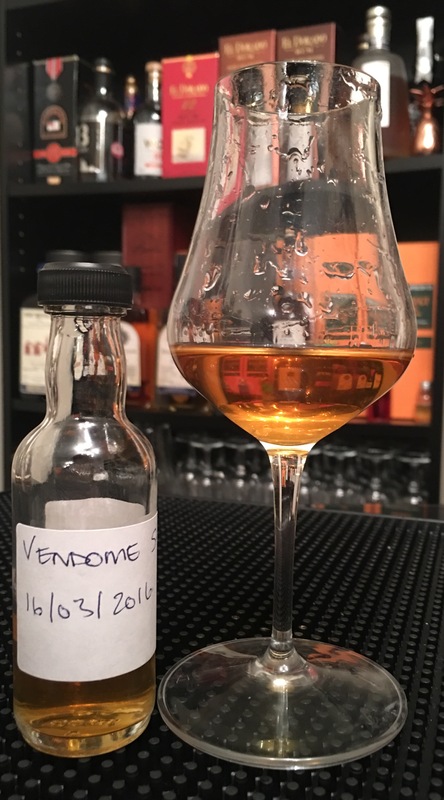 It is again, very drinkable stuff and whilst its no slouch, it doesn’t posses the complexity of any of the French West Indies offerings……you can see where the influence of the more mature agricole comes in on the 4th Edition of the 1931 series….for me it is a welcome addition to that blend. Glass: Light gold in appearance and also quite light on the nose. Coconut, milk chocolate and pencil shavings are the first discernible aromas. Vanilla and a touch of nutmeg round the nose out along with light floral notes. Mouth: The Rum has a light body in the mouth with a very dry, oaken entry. The milk chocolate is there still along with vanilla, and a hit of white pepper. The finish is dry and of a medium length and is dominated by the light vanilla and oak. Glass: Clear with what appears to be a light blue hue. Clean, fresh pot still aromas abound. Pear drops, an unmistakable salty freshness of black olives and brine. That medicinal, almost iodine note that I expect from this still is abundant. Its vegetal and there is a creamy liquorice to round things out. Mouth: It has a lighter mouthfeel than expected given the olive heavy nose. A mild banana like sweetness brings in the savoury / sweet note of biting into a ripe pear. Varnish powers through the mid palate with black pepper and the medicinal iodine note is very clear. The medium length finish is full of liquorice with the mildest hint of peaches. Glass: Light gold. Punchy. Very punchy. Straight up front, uncompromising medicinal iodine notes and light smoke. Oak is very apparent along with a delicate sweet / sour note. Raisins and a peppery tingle accompany acetone and another whiff of smoke. Prune juice rounds things out with something reminiscent of apple and mango juice. Mouth: An initial sweetness of Pontefract Cakes (liquorice) leads with some antiseptic. Heavy on the medicinal notes. There is a peppery mid palate laden with drying oak, Bramley apple sauce and mango puree. A light toffee and herbal note follows. Quite savoury. The medium to long finish is where the magic happens. A very spice led dry oak and pepper develops into a leathery note with the smoke and iodine sticking around until the bitter end. This has remarkable complexity for its 5 years of maturation. 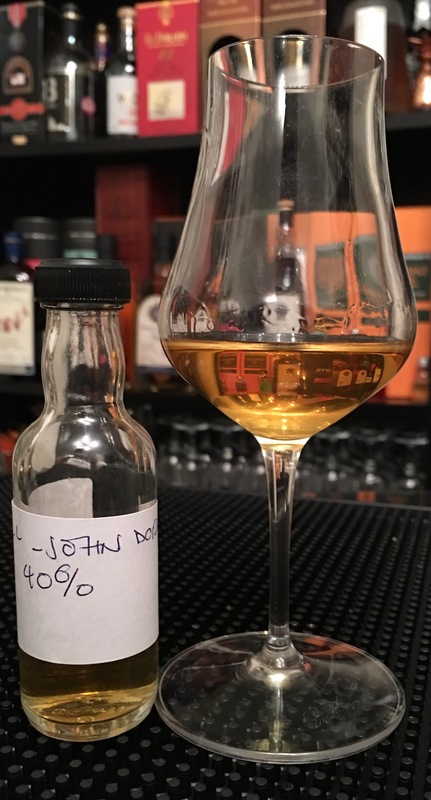 Yes it needs more abv punch (I have an indie bottle that rectifies this) but you can tell that in a blend, a little John Dore goes a long way. I can see how this could be considered out of balance for some, but with the medicinal notes, obvious barrel influence and a hint of fruit, this is totally my thing. Glass: A darker, reddish gold. This is not as punchy as the John Dore. It feels like there is more astringency on the nose. Rubber is apparent but it is more like balloons. Oaken, creosote notes hit home with pencil shavings and a mild medicinal note. Caramel and light treacle bitterness round it out with a floral honey. Mouth: Lighter than the nose dictates. Spikey black pepper leads with a slightly sweet herbal character. Mango and a light honey note fight through before a slight bittersweet taste appears. Medicinal iodine notes are there, albeit subdued they do come to the surface as the bittersweet kicks in. A drying bitterness develops on the medium long finish that leaves my mouth full of oak and fennel seeds. This component is massively apparent in the new Elements 8 Vendome (replacement for the Gold). Yes I know that its noted on the label but its more apparent than on the older Gold bottling. A little self indulgent perhaps given the lack of opportunities to obtain most of these distillates. There are some of the pot still bottlings available within the Secret Treasures range. On a personal level I have found this run through of the various distillates very entertaining. You start to pick out differing components within the blends more accurately based on their attributes when tried as individual distillates. 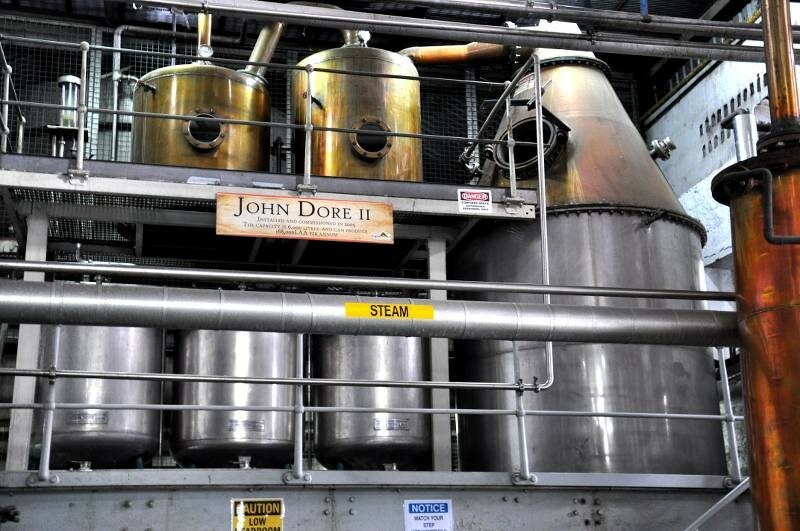 The John Dore I & II and Vendome Pot Stills are fast becoming my must seek out pot still bottlings. They have their own signature in the way that the mythical Rockley (Style) Still does and it’s that medicinal, slightly smoke driven note (more so in the John Dore I) that adds so much to the blends that they are used in. With such a huge range of marques available from their excellent array of stills, coupled with new French investment, what I would love to see in the future….and I believe wholeheartedly that the market is there for it…is a range similar to the recent Mount Gay Origins releases and the Habitation Velier range. A rare opportunity to try (at a decent +45% abv, full bottles, maybe 200ml bottles or 90ml tube container) these individual components along with a little background, still history and in-situ images of the stills. Fingers crossed. © Steven James and Rum Diaries Blog 2017. Unauthorized use and/or duplication of this material, both written and photographic without the express and written permission from this blog/sites author and owner is strictly prohibited. Excerpts and links may be used, provided that full and clear credit is given to Steven James and Rum Diaries Blog with appropriate and specific direction to the original content. This April, UK distributor Emporia Brands have put together a calendar of events involving its award-winning St Lucia Distillers range. Brand Ambassador Dave Marsland will be touring four Northern cities as he brings together the Chairman’s Reserve range, which includes Gold, Spiced, White Label and Forgotten Cask, the Admiral Rodney, and the latest edition of 1931, the 4th release. In 1931, the Barnard family founded a distillery at Dennery. 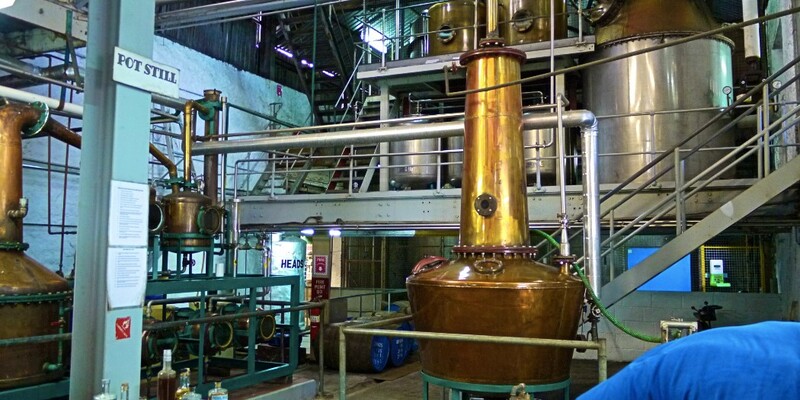 Now based on the other side of the island at Roseau, the distillery has been considerably modernized and new technologies and improvements constantly incorporated. 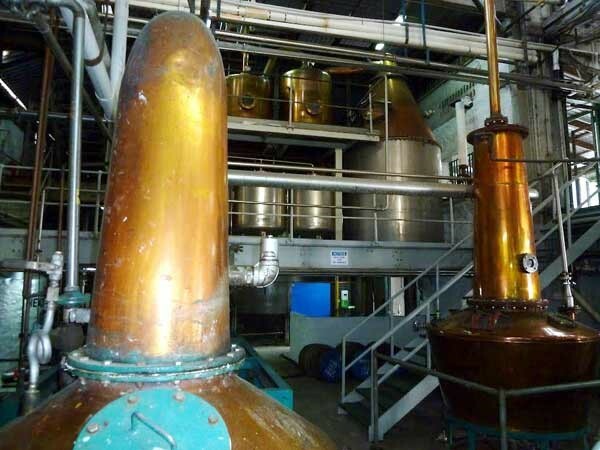 The installation of pot stills in 1998 added considerably to the variety of rums being produced in this highly regarded distillery which received the accolade of Individual Distiller of the Year at the International Spirits Challenge, one of six trophies received in six years – a unique achievement. With the premise of a flavour experience, the tour sees an approach to the range that offers bartenders and key industry figures invited to not only learn about St Lucia, but ideas on how to embrace the versatility of St Lucia Distillers, from the Spiced variety to the rare 1931. With Liverpool, Manchester, Leeds and Newcastle on the agenda, Emporia Brands are looking to strengthen their campaign as they look ahead to the next instalment of the ‘Chairman’s XI’ with their ever-expanding sales team seeking out some of the UK’s best and brightest to follow in the footsteps of some of the industries key figures, including Lyndon Higginson of The Liars Club in Manchester, Danny Murphy of Aloha in Liverpool and Adam Binnersley of the MOJO Group. Places are limited to 30 maximum for each session, due to the rarity of gaining the exclusive 1931 4th Edition for the tasting’s. To secure your place, please contact Dave Marsland at dave@emporiabrands.com, stating the session you wish to attend from the list below. A welcome drink will be offered, as well as a half-time serve of a Chairman’s White Label Daiquiri, and a finish of the 1931 4th edition. If there is even the slightest chance that you can make it and places are still available, this is a must. The quality and number of styles coming out of St Lucia Distillers is phenomenal and if rumors are to be believed, there may be a few special distillates to try too. © Steven James and Rum Diaries Blog 2016. Unauthorized use and/or duplication of this material, both written and photographic without the express and written permission from this blog/sites author and owner is strictly prohibited. Excerpts and links may be used, provided that full and clear credit is given to Steven James and Rum Diaries Blog with appropriate and specific direction to the original content. Emporia Brands HQ asked a number of their award-winning brands to send across their festive recipes, perfect to impress your friends and family with. 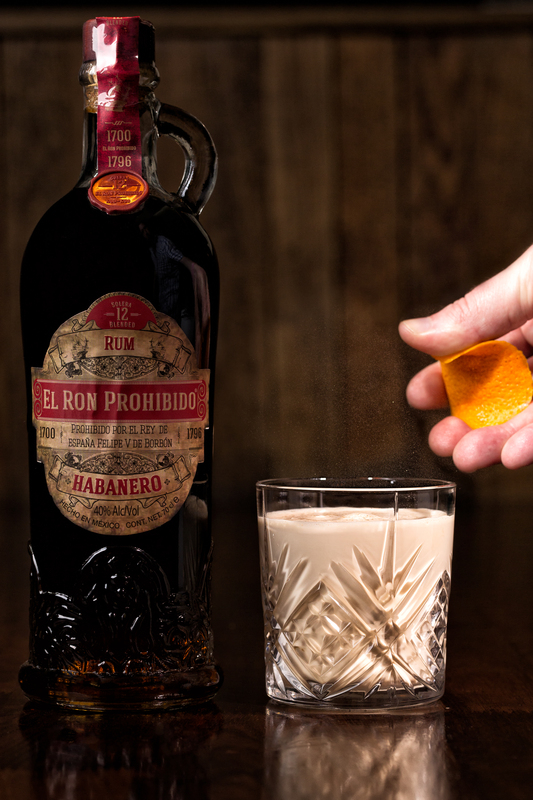 Ron Prohibido – ‘the forbidden rum’ – is a unique premium Latino rum from Mexico. Made in a traditional 12 year solera with a unique combination of column still rums, Ron Prohibido was, in the 17th century, shipped in used sweet wine barrels to Spain where the distinctive sweet and bitter taste it acquired during the voyage was much appreciated…so much so that local producers in Spain persuaded King Felipe V to ban it – hence “prohibido”, the forbidden rum. Now, over 300 years later, this delicious rum is available in the UK for the first time. Stir the coffee and sugar until the sugar dissolves. Stir in Ron Prohibido and add the cinnamon and the strip of orange zest. Garnish with whipped cream, grated chocolate and grated orange zest. Osborne is one of the oldest and most prestigious wine and spirit producers in Spain. Founded in 1772 by Thomas Osborne Mann to supply sherry to the UK, it remains 100% family owned, and is now run by the seventh generation. The brightest vinous jewels in Osborne’s considerable crown are the very old rare sherries (vors). these are exceptional sherries from very special soleras, all of which were established nearly two centuries ago, and the solera for Sibarita is in fact the oldest in Jerez, dating back well over 200 years to 1792. These precious sherries have found worldwide acclaim, and are found on the lists of top restaurants around the world. Stir all the ingredients within a mixing glass over ice, then strain into a coupette. Both cocktails look pretty tasty! Now we don’t have the Osborne PX here at Rum Diaries HQ but we do another bottle of PX and of course we have Chairman’s Reserve so we are odds on to fire one of those up at some point over the Christmas period! We are back on the subject of St Lucia Distillers again for the third post in my mini series on the distillery. Again, to refresh yourselves on the background of St Lucia Distillers, Chairman’s Reserve and Admiral Rodney Extra Old St Lucia Rum please click on the links. Now you’re all refreshed and in possession of the history of the distillery, we can talk about not one, not two, but three expressions of this celebratory Rum. 1931 by St Lucia Distillers. As you will have noted the first post on St Lucia Distillers, the Dennery Distillery in the Mabouya Valley was commissioned in 1931 by Denis Barnard on the site of his family plantation and Rum was produced there until the merger of the Dennery and Roseau Distilleries and subsequent formation of St Lucia Distillers in 1972. The St Lucia Distillers 1931 Limited Editions are produced using some of the finest aged stock at the distillery in commemoration of this date. Currently there are three editions. 1931 Edition 1 was released in 2011 to celebrate the 80 year anniversary and was the first Rum to qualify for the Deluxe Authentic Caribbean Rum Marque. 1931 Edition 2 was released in 2012 to celebrate the 81 year anniversary and also possesses the Deluxe ACR Marque. 1931 Edition 3 was released in 2013 to celebrate the 82 year anniversary and again, possesses the Deluxe ACR Marque. Quite unique in their own right being blends of varying ages, cask finishes and if rumour is to be believed with the imminent Edition 4, varying styles! It makes sense then that a little information should follow about each edition, so here goes. 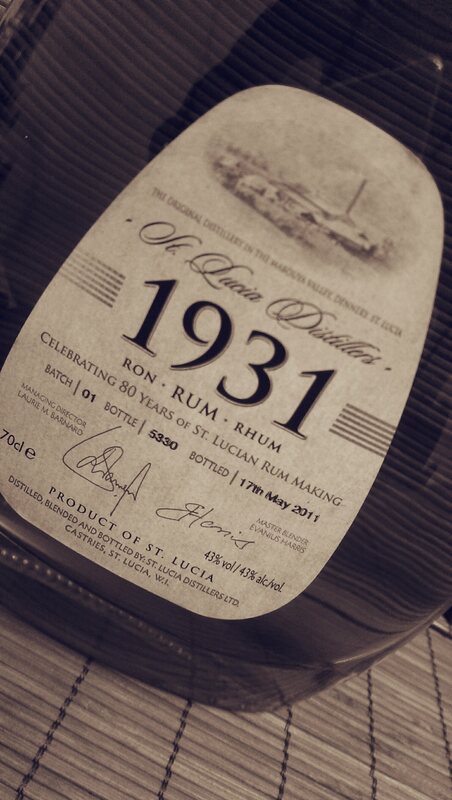 St Lucia Distillers 1931 Edition 1 – 43% abv. My bottle is number 5330, is from Batch 01 and was bottled on 17th May 2011. This release celebrates the 80th Anniversary and is a blend of 9 casks containing distillates from their three Pot Stills (John Dore 1, John Dore 2 and Vendome) and their two column Coffey Still. These casks were judged to contain some of St Lucia Distillers finest Rums and their ages varied from casks laid down in 2004 to older distillates laid down in 1999. Of the 9 casks used, 7 were American White Oak (ex-bourbon) and two were Port Casks. The distillates were blended and then placed back into American White Oak for 3 months to allow them a period to marry prior to being bottled. To echo the methods in use in 1931, only light filtering was used prior to being bottled to preserve the blends integrity. No chill filtering took place. This Rum also has the honour of being the first Rum to qualify for the ACR Deluxe Marque. In the glass: The Rum is a beautiful burnished gold with hints of deep mahogany. Straight away the pot still element is massively evident, even before pouring. There is also a touch of smoke billowing out of the glass as the Rum settles. Raisins and dates are apparent as is a real nose tingling astringency. Molasses, toffee and vanilla also fight for your attention. That pear drop element from previous St Lucia Distillers releases is there too and it is rounded out by more smoke and the time that components of this Rum have spent in oak is very prominent as this accompanies the smoke. That astringent tingle is still there too. 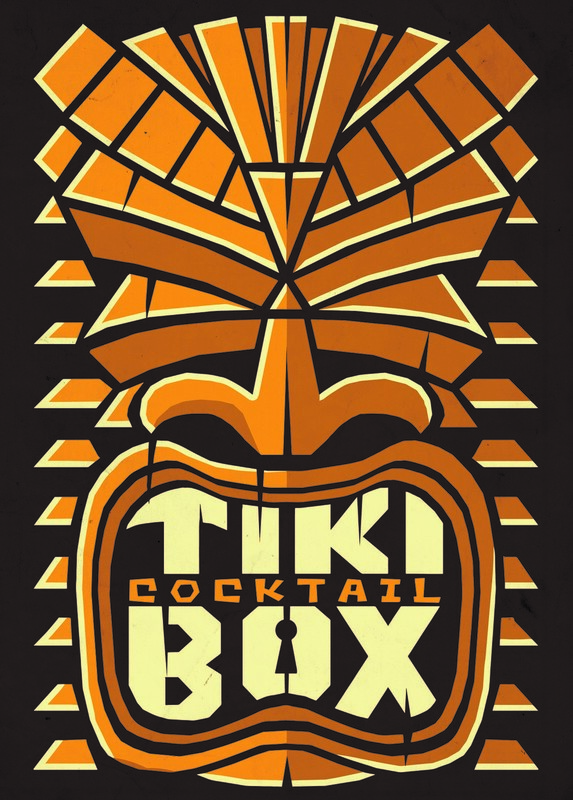 In the mouth: Straight away you are struck by the medium / heavy body of the Rum. Again the pot still component hits you like a truck. There is nothing gentle about that element. Oak, those raisins and vanilla are very prominent. 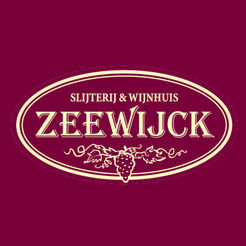 Further sips, especially when held in the mouth for slightly lengthy periods reveal grapes, orange oils and chocolate. The Rum is sweet initially, not overly so, and dries out nicely but not excessively. 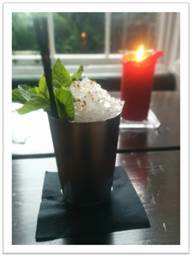 It is a warming Rum with peach, banana and smoke staying with you in the form of the vapours left in your mouth. The pot still really carries this Rum and introduces honey roast nuts too. 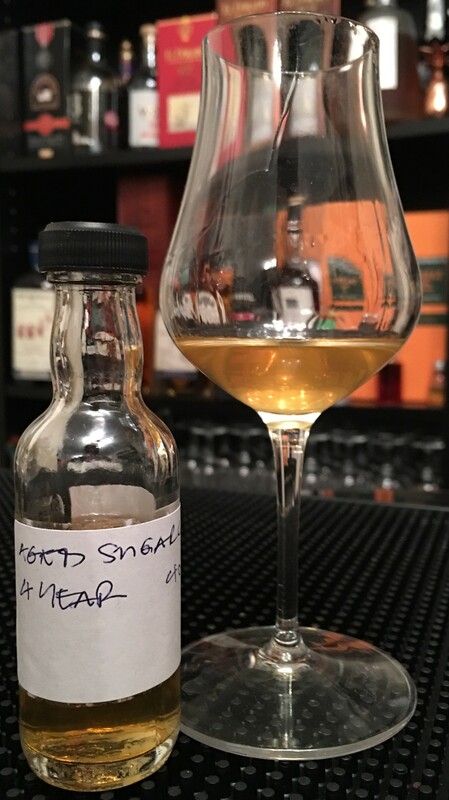 The finish is medium / long and starts with pot still but it then runs the gamut of peach, vanilla, banana and finally finishes with a smoky leather. The oak is not as dominant as it is in the Admiral Rodney, but it is there. 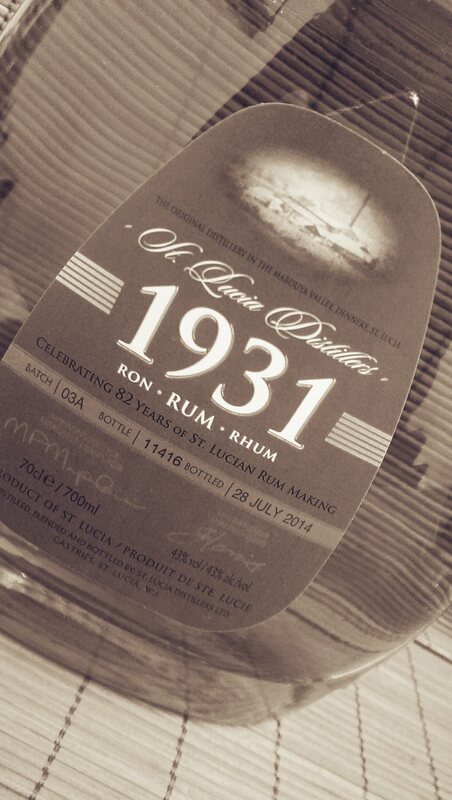 St Lucia Distillers 1931 Edition 2 – 43% abv. My bottle is number 9652, is from Batch 02 and was bottled on 23rd July 2012. This release celebrates the 81st Anniversary and is a blend of distillates laid down in 2004, 2005 and 2006 and includes casks containing 100% Coffey Still distillates matured in a combination of American White Oak and Port Casks, 100% Pot Still distillates from their three Pot Stills and 50/50 blends of Pot and Coffey Still distillates matured in American White Oak. The distillates were blended and then placed back into American White Oak for 3 months to allow them a period to marry prior to being bottled. Again, only light filtration was used. In the glass: Again the Rum is a gold with mahogany. Maybe a shade lighter than the first edition. Straight away it is the pot still that hits you with a toffee and butterscotch sweetness. There is none of the astringency of the first edition. Oak is also a factor though again, not as prominent. Dried banana chips, apple pieces and the smallest wisps of smoke are holding it all together. Hazelnuts, the slightest hint of raisins and a light bourbon cherry are present. This is a better experience on the nose than the first edition as that astringency doesn’t limit your time with your nose in the glass. Molasses and a light chocolate round the experience out along with that pot still component. In the mouth: Pot still again leads from the front like a battle hardened bruiser of a man! The port effects are way more prominent on this Rum along with that drying oak taking the edge off the sweetness. This has a heavier body than the first edition (for me) and there is a big hit of molasses accompanied by a touch of chocolate. Vanilla and a touch of smoky oak are in there and the dried bananas are also in the mix, but I can’t find the apples that I had in the glass. The finish on this one is very long. It is all caramel, oak, pot still, a little chocolate, grape and vanilla and it dries to an oaky, tobacco and leather finish. 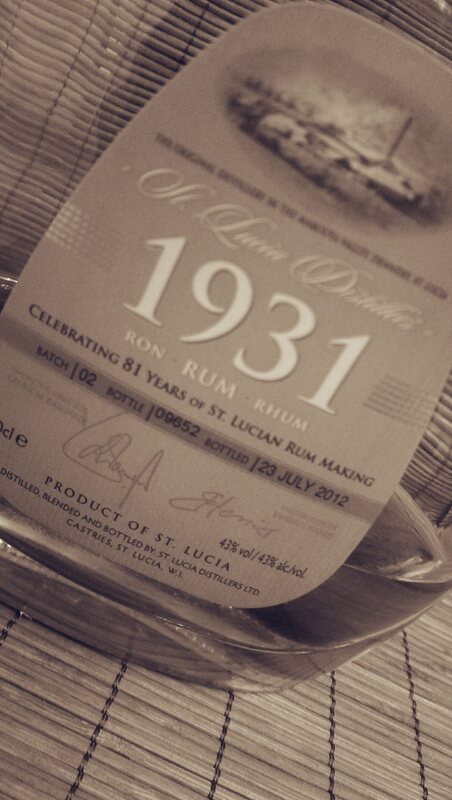 St Lucia Distillers 1931 Edition 3 – 43% abv. My bottle is number 11416, is from Batch 03A and was bottled on 28th July 2014. This release celebrates the 82nd Anniversary and is a blend of distillates from the three Pot Stills and the two column Coffey Still. The casks that were chosen were judged to contain some of the finer Rums produced by St Lucia Distillers. The Coffey Still distillates were matured for 6 and 11 years and the John Dore Pot Still distillates were matured for 14 and 15 years. A blend of Vendome and John Dore Pot Still distillates aged for 10 years is also utilised. Additionally, a 7-year-old Port Cask matured Coffey Still distillate and a 7-year-old Port Cask matured John Dore Pot Still Distillate are used. Quite a collection which just displays the sheer amount of distillates available at the distillery. The distillates were blended and then placed back into American White Oak for 3 months to allow them a period to marry prior to being bottled. Once again as with the previous two editions, only light filtration was used. In the glass: The Rum is a dark gold with amber flashes. As is the common theme, that pot still punches you straight away but this time there is also something medicinal! It is very much like the flavour found in the Rockley Still Rums from Barbados. It sets it apart from the first two editions for me. Oak, vanilla, honey and more of that apparent port astringency from the first edition is back. The Rum feels creamy and has a tobacco and warming chocolate edge to it with that pot still underlining all of the other flavours. In the mouth: The sweetness is the first thing that hits me on this one along with that medicinal Rockley Still element. Pear drops are back alongside some milk chocolate. There is something savoury on the back of my tongue when the Rum has gone. Almost buttery and salty. Red apples accompany the astringency along with grapes, red wine, oak and a little tart note. Again the finish is long and wrapped in port, vanilla and oak and it doesn’t dry as much as the others. The aftertaste is smoky oak and that medicinal note. 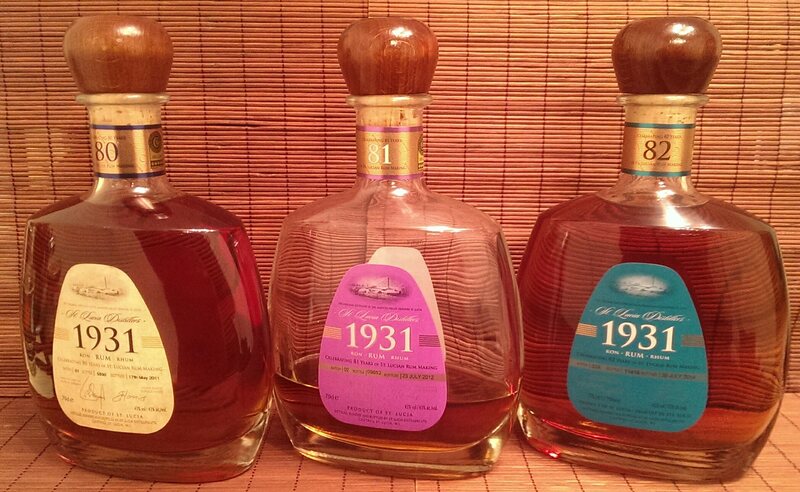 St Lucia Distillers 1931 Edition 1 and 2 blend – 43% abv. 25ml of each in a bottle and left to marry for a period of one week. This is my own silliness and has been done to satisfy my own curiosity as a conversation with a nameless person at a nameless expo may (or may not) have revealed that a blend of the first two editions may (or may not) be the components of an exclusive release. In the glass: The astringency of the first edition has been calmed. This is very mellow and has vanilla, molasses, bourbon cherry, chocolate and hazelnuts. It is also very creamy though somewhat dulled. In the mouth: This is ridiculously smooth. None of the slight roughness of the individual components. Pot still is there but strangely it is not the dominant factor. Raisins, honey and oak are in there and the finish is a medium / long one full of oak, vanilla and pot still. Some of the individual stand out components of each of the two editions as individuals have been lost by blending. It is however smooth, warming and quite decadent. It will go down very easily and be a bit of a crowd pleaser but it’s just not as interesting as the individual Rums and therefore doesn’t hold your attention for as long. As this is a comparison tasting of all three editions, unfortunately you clearly need all three of these Rums in your collection. They each represent how good St Lucia Distillers are at making the most of their individual components. They are all flavourful, interesting Rums in their own right and they offer a solid experience, especially when tasted together as you really do then appreciate how different they are but also how they have a shared heritage. If I were to buy only one of the three editions though (or recommend a bottle to you), it just has to be the 1931 Edition 2. It has all of the good, but none of the astringency. To choose a runner-up is more difficult. I really like both of the other editions but I’m a sucker for that little bit of a medicinal note in a Rum so I’d put 1931 Edition 3 in second place but that is purely personal preference as I also love 1931 Edition 1. But of course, 1931 Edition 4 is due for a release, and that is rumoured to contain agricole from St Lucia Distillers own grown sugarcane so that will add a further element into the mix! Just know that whichever edition you pick up, you will have made an excellent choice and have a lot of enjoyment from the bottle. If you have experience of any of these releases, please share your opinions. For the purposes of full disclosure, throughout the whole of this series, which is not sponsored in ANY way, I have personally purchased the entire Chairman’s Reserve Range (multiple times), Admiral Rodney (multiple times), 1931 Edition 1 and 1931 Edition 3. I was supplied with a third of an opened bottle by Emporia Brands (shared with Simon Difford I believe) of 1931 Edition 2. Each of the three Editions of 1931 will set you back between £55 and £65 each dependent upon where you pick them up from. 1931 Edition 1 is all but gone n the UK with no further supplies expected. What is on sale is all that there is. Supplies are still there of Edition 2 and 3. I seemingly purchased all but my favourite, so I guess I’ll have to go online shopping again! 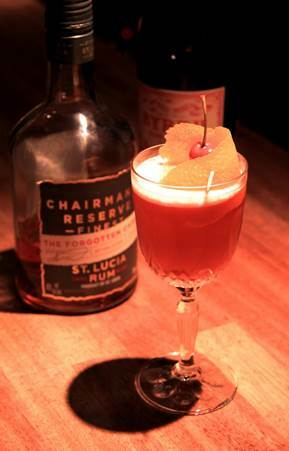 St Lucia Distillers has recruited a new Chairman’s Reserve X1 who are currently touring top bars in Manchester, Liverpool, Leeds and Sheffield giving mixology demonstrations, cocktail tastings and discounted serves to eager customers who want to taste the rums which have won the “Best Rum” Trophy four times in the last six years. 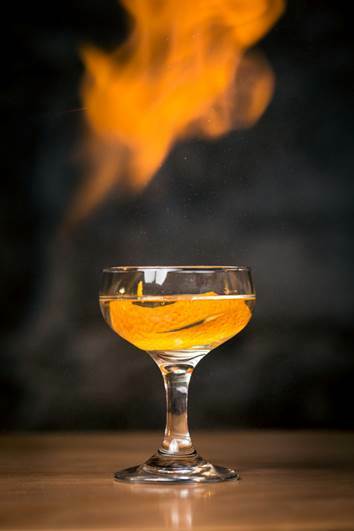 The tour started at Kosmonaut Bar on Tariff Street, in Manchester’s Northern Quarter where Tom Higham has invented a new cocktail ‘5 Spice Sour’ to accompany their Spice Club evening when they serve a grand home-style 4 course Indian meal (recipe below). Montpellier’s Café on Back Turner Street, Manchester organised a “Caribbean Calling” evening and informal food-pairing event with Chairman’s White Rum, Chairman’s Spiced and it included a warm goat’s cheese, pine nut and honey salad paired with a Honey and Walnut Rum Manhattan using Chairman’s Reserve Finest Rum. The Almost Famous Bar at 100-102 High Street also in Great Northern, Manchester will also be offering individually created cocktails by four of the new Chairman’s Rovers X1: Adam Binnersley, Jonathan Leathley, Brodie Meah and Tom Higham at the new outside terrace area on Tuesday 26th August, when all four join forces to run the Chairman’s Reserve evening pop-up. 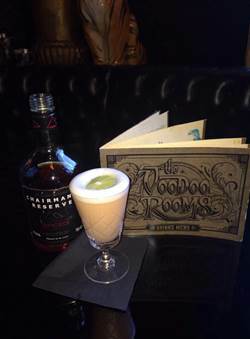 Also at Almost Famous, a new Chairman’s Reserve Rum cocktail called ‘Custard Reserve’ specially created by mixologist Jonathan Leathley will be on the drinks menu – for the recipe – see below. 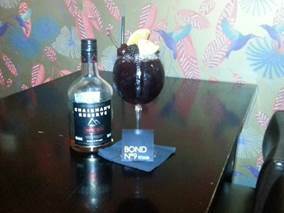 On the same evening, Under New Management, the popular bar in Barlows Croft, Salford M3 5DY will host a late-night session with plenty discounted Chairman’s Reserve Rum serves including Brodie Meah’s new rum cocktail ‘Watermelon Punch 1999’ – recipe below. 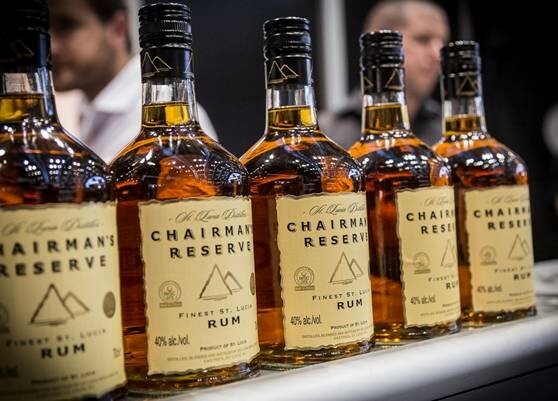 Liverpool, Leeds and Sheffield will also be hosting in the coming weeks master classes of Caribbean rums from St Lucia showing the blends of pot and coffey still rum from one of the world’s most successful distilleries. 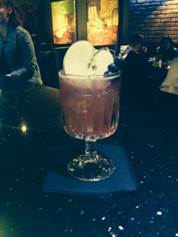 ‘Watermelon Punch 1999’ – Brodie Meah at Under New Management , Salford. 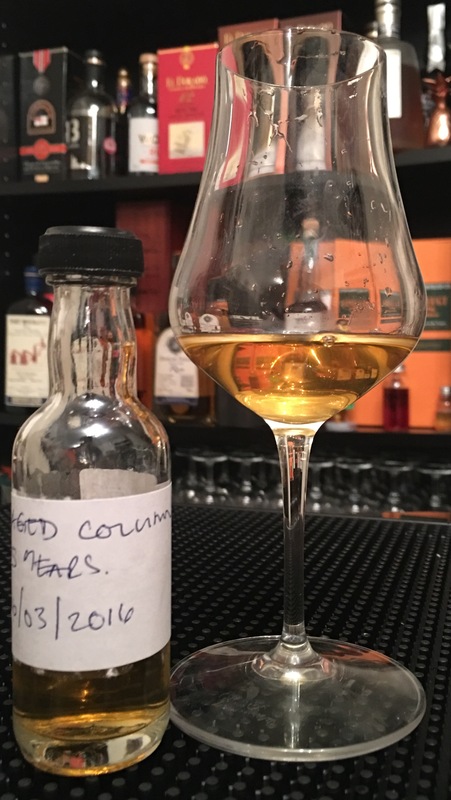 St Lucia Distillers, as a member of a Commonwealth Country, has organised a cocktail competition with a difference in Scotland. 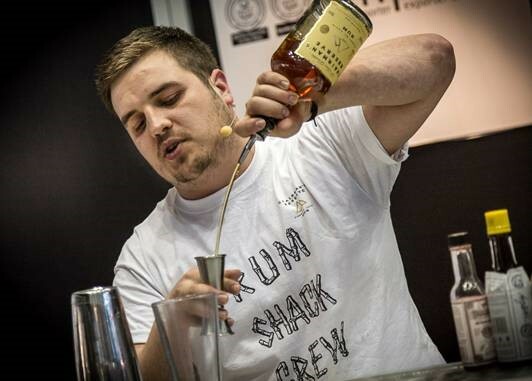 In conjunction with their UK distributors, Emporia Brands Ltd, they have invited a number of leading bartenders from Edinburgh, Glasgow and Aberdeen to take part, competing for a chance to go to the 100m finals session at Hampden Park on Monday 28th July. 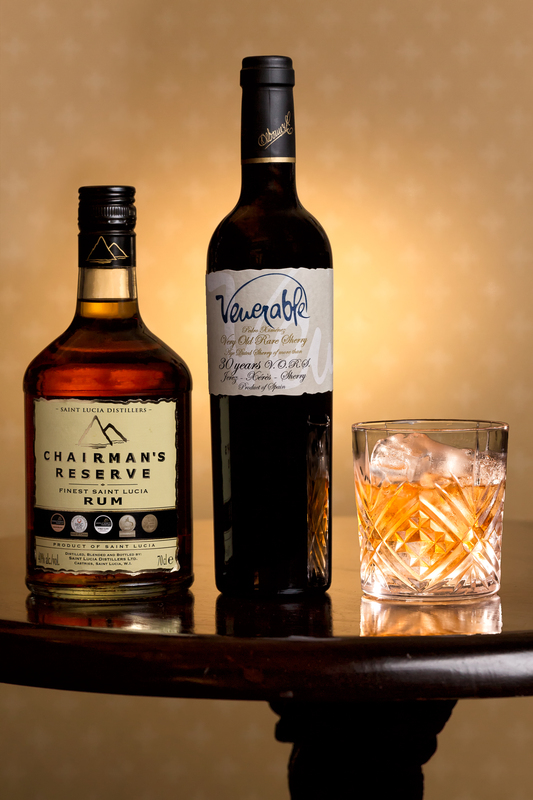 The bartenders have been asked to come up with an original Chairman’s Reserve cocktail, using any of the four expressions available, which have all been posted on the Chairman’s Reserve UK Facebook site. The challenge is for these bartenders to market their drinks through their bars and social networks for a week & ‘Sprint to the Finish’. The cocktail creation that has manages to attract the largest number of likes at the end of a week, on Thursday 24th July, will be the winner and we will accompanied to the Blue Ribbon event (men’s 100m finals) by the Chairman of Emporia Brands, James Rackham to enjoy prime seats for the event in a corporate box at Hampden Park. The only requirement regarding the drinks they have been asked to make, is that the base spirit must be one of the four Chairman’s Reserve expressions (Chairman’s Reserve Finest, Chairman’s Reserve White Label, Chairman’s Reserve Spiced or Chairman’s Reserve ‘Forgotten Casks’). 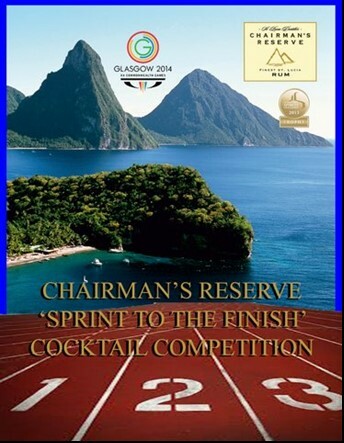 The nature and style of their creations was left entirely to the participants and as a part of their marketing exercise, to decide whether to appeal to bartenders, consumers, St. Lucians or lovers of the Commonwealth Games. Add all ingredients except Root Beer to a mixing tin, shake and pour into a highball glass over cracked ice. Float root beer over the top. 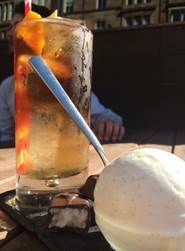 Garnish with an Orange Twist, with Vanilla ice cream and Coconut Chocolate on the side. Enjoy while picturing yourself on its namesake beach! 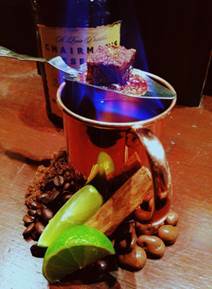 Again, all of these drinks sound awesome……..keep your eyes peeled on the Chairman’s Reserve Facebook page for proceedings….